Welcome to another Becoming A Modern Man! 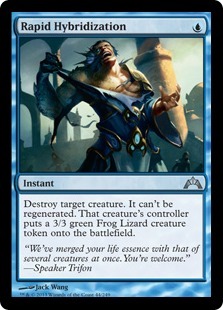 In this article I am taking a look at Scapeshift , or what seems to be increasingly referred to as TitanShift, in Modern. I actually don't remember where I took this decklist from anymore so apologies for no credit given. Let's start off by looking at how the deck works and the combo it is trying to achieve. This is really the key to the deck and once you understand this then the rest is pretty straightforward. For those not familiar with the deck, this deck is primarily a combo deck. 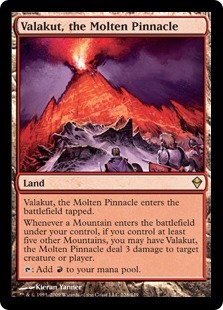 The deck is entirely based around Valakut, the Molten Pinnacle and its ability to Lightning Bolt every time a Mountain enters the battlefield once you have over 5 Mountains on the battlefield. 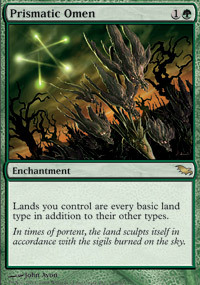 This allows you to deal a lot of damage with each of land drops. 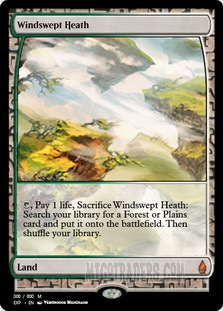 The combo element comes with Scapeshift which lets you sacrifice as many of your lands as you require and tutor up the same number of lands and put them into play. 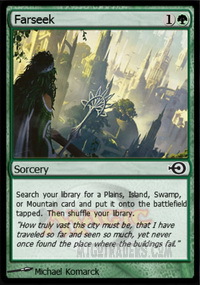 With seven lands you can Scapeshift and put a Valakut and 6 Mountains into play for 18 points of damage. Eighteen damage is generally lethal in Modern thanks to the prevalence of fetchlands and Ravnica duals. 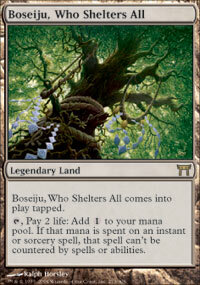 Titan is one of the key cards in the deck and our secondary route to victory if we cannot combo kill with Scapeshift . 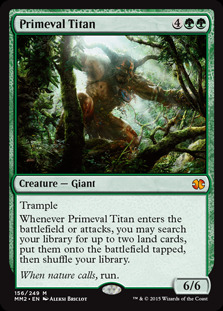 Primeval Titan allows us to search up any two lands from our deck, which primarily will be a Valakut and a Mountain or in some cases two Valakuts. 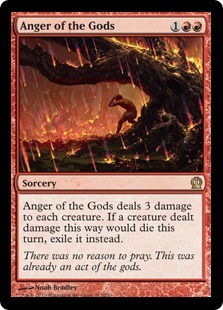 This allows us to start hitting Valakut triggers and also we have just put a 6/6 trampler onto the battlefield which will search up more lands each time it attacks for further Valakut triggers. 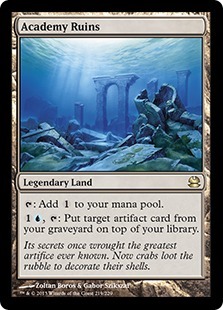 Titan requires an immediate answer on most occasions and even if Titan is immediately hit with a Path to Exile or some other removal spell it's already got you the value of tutoring up two lands. 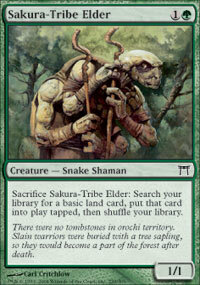 Sakura-Tribe Elder is an excellent card for the deck. It can save you a good amount of life by chump blocking an oncoming attacker and then being sacrificed before damage. The deck is really just looking to stall and ramp until it can either cast Primeval Titan or Scapeshift and this card both buys us time and ramps us. It's a perfect combination for the deck. Prismatic Omen is a rather unusual enchantment that has a particular niche in combination with Valakut, the Molten Pinnacle . 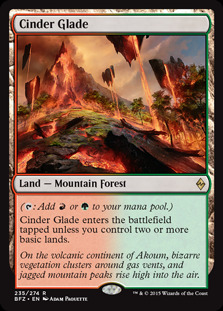 With Prismatic Omen in play all of our lands are Mountains. 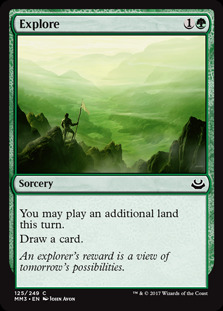 This means you can perform the Scapeshift with only six lands as Valakut itself is now a Mountain and counts itself as such. It also means that you can search up two copies of Valakut with Primeval Titan and the new copies of Valakut will each trigger twice for 12 points of damage. Omen is not essential to the deck but does make Valakut that much more powerful when it is in play allowing us to speed up the combo. 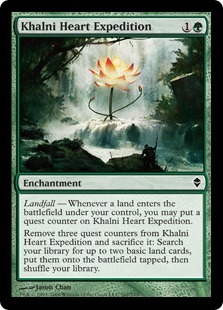 Khalni Heart Expedition doesn't see play in all version of the Scapeshift deck, however, it is a cheap way of searching up two lands at the same time. This can be a good way to get two Valakut triggers and at instant-speed too, if necessary. Otherwise, it's two ramp spells in one - albeit with a bit more setup required. As described above this is the killer combo card that allows you to deal 18+ damage in one fell swoop. It is the quickest way to kill with the deck and is simply a matter of counting to 7 most of the time. Sweltering Suns is a very useful sweeper to clear the opponents board but has the advantage of also being able to be cycled if your opponent isn't playing a creature based deck or you just need to dig one card deeper. Explore allows us to dig a card deeper into our deck and lets us play an extra land out of our hand. An excellent combination of draw and ramp in one card. A Rampant Growth but one that has the advantage of being able to search up Cinder Glade and/or Stomping Ground to help fix your mana. 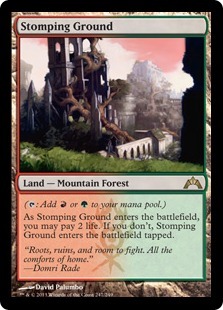 Generally, you will want to finding Stomping Ground with Farseek as it means you don't have to take the 2 pain to have it untapped as you would if you draw it and some of our ramp cards can only find basic lands so we are reserving them for other cards. Our only real one-drop, and actually it is a 3-mana spell. The deck doesn't have much to do on Turn 1 so having a Search for Tomorrow in your opening hand is ideal for getting us off to a quick start. 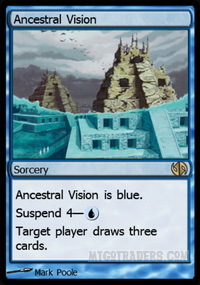 Also note that unlike other Suspend cards that you are likely to see in Modern, such as Ancestral Vision and Living End , it is perfectly reasonable to hardcast Search for Tomorrow for its mana cost. 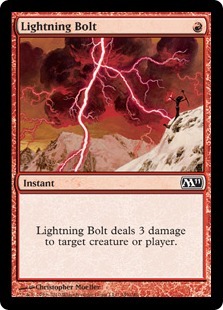 Lightning Bolt came back in a big way at the Pro Tour, after spending a long time demoted behind Fatal Push as the top removal spell of the format. In this deck, Bolt buys us the time we need to build our mana or can be the finishing touch on our opponent's life total. Summoner's Pact is a very powerful tutor effect but one that comes at a large cost the following turn. Pact is an instant but you will be looking to play it on your main phase to allow you to play the creature immediately and pay later, rather than the other way around. 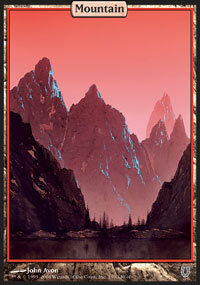 The primary use of Pact is to tutor for Primeval Titan , so Pact is effectively Titans 5 & 6 in the deck. 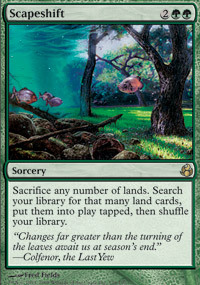 However, Pact can tutor for any green creature so there are corner cases where you will want to search for something different, particularly after sideboarding. 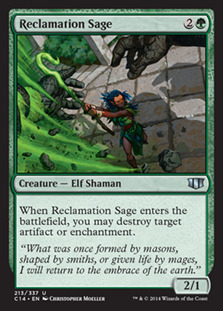 Tutoring for Reclamation Sage post-board can be an excellent play. 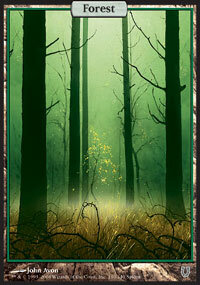 This deck runs 27 lands, which is more than any Modern decks I have ever played previously. Obviously there is a good reason for this. The deck really just wants to hit a land drop, or if possible more than one, each turn to either cast Primeval Titan or to combo with Scapeshift . 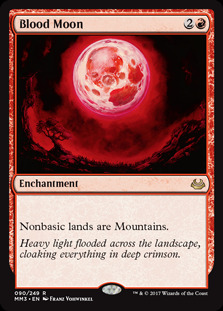 There are 14 Mountains in the deck, which is important to remember if you are looking to cast Scapeshift in the late game - you do not want to sacrifice too many Mountains or you will not meet the 6 Mountain threshold for Valakut triggers. 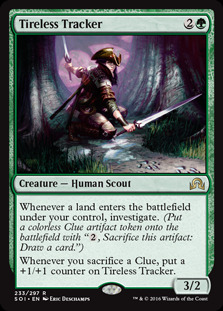 The key combo piece and the basis for the whole deck. Valakut triggers a Lightning Bolt each time a a Mountain enters the battlefield after the fifth. 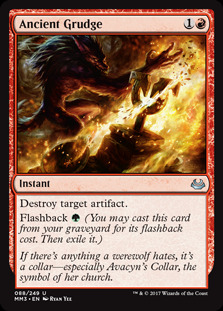 This is very powerful in itself but cards like Scapeshift and Primeval Titan make it that much more of a frightening prospect. 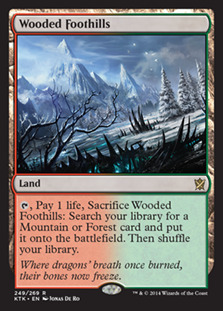 Our three dual lands have the dual land type of Mountain Forest which is extremely important for the deck as it means they all count towards your Valakut triggers. Also, as I mentioned earlier it means that they can be put into play with Farseek . 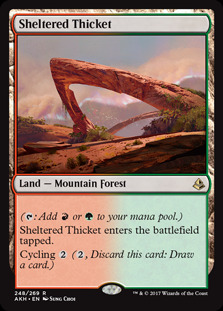 Sheltered Thicket from Amonkhet fits nicely into the deck as a land you can cycle away in a pinch or if you are flooded. 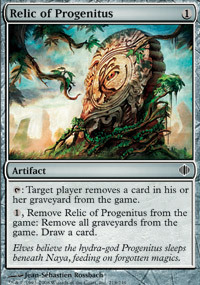 Relic of Progenitus is a powerful graveyard hate card. 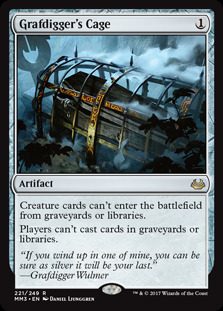 A lot of decks are looking to abuse the graveyard, such as Dredge, Hollow One, Storm and Snapcaster decks and even Lantern has Academy Ruins . Obviously being in Gruul colours means we have plenty of access to artifact hate - in the form of Nature's Claim , Ancient Grudge and Reclamation Sage . 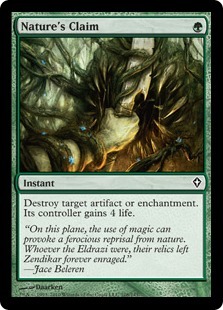 Green also gives us enchantment hate which can be relevant. Notably (Reclamation Sage can be tutored for with Summoner's Pact if you are stuck under Blood Moon or if a Witchbane Orb /Leyline of Sanctity is preventing a Valakut kill. 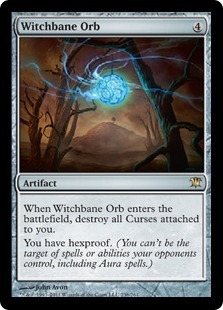 Witchbane Orb prevents us getting burned out and turns off the combo kills of opposing Scapeshift , Storm and Ad Nauseam decks. Anger of the Gods gives us an additional sweeper to bring in if we think it's likely we will need to a board wipe to survive. 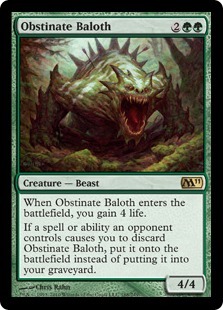 Obstinate Baloth is a source of lifegain and also gives us a substantial board presence which can be difficult for opposing decks to attack through. Baloth is also a nice card to have against Liliana of the Veil decks as you can pitch it into play when they +1 Liliana. Tireless Tracker gives us another path of attack and can be good in a variety of different situations. It's probably best against Control decks or any deck that is likely to have sideboarded out their removal spells against us. Tracker can build huge card advantage and is a substantial threat in its own right and is all the more powerful when combined with ramp spells. Our first matchup is against Abzan. This matchup seems pretty favourable as it is difficult for our opponent's to interact with our combo beyond the use of hand disruption. As such, provided we can avoid taking on too much pressure early on we should be able to hit get Valakut going and pick up a win. Our second matchup is against Bogles, played by the innovator of the Modern Taking Turns/Time Walk deck. This matchup is pretty interesting as we do not have a ton of enchantment hate in our sideboard. We do have some good card for this match though. Sweltering Suns can wipe out their hexproof guys if you catch them early enough and post-board we have Reclamation Sage and the ability to use Summoner's Pact to find it. Not an easy matchup but if we can disrupt their clock long enough we can get there. Our third matchup is against GB Tron. This match seems a bit tough as the powerful things they can be assembled a bit quicker than our combo. That said their deck isn't particularly fast and so long as you're not facing down an early Karn Liberated you can carry on your way. The matchup largely comes down to who gets to hit the hay-makers first. Our fourth matchup is against a pretty interesting Simic Evolve deck. The deck is based around Evolve creatures and the interaction with Undying creatures and Pongify /Rapid Hybridization allowing for double Evolve triggers while also adding an additional 3/3 token to the board and increasing the size of your Undying creature. The match can be tough as our removal isn't quite so effective against Undying creatures and the deck can deal a lot of damage very quickly. The race is certainly on. Our fifth matchup is against Jeskai Midrange/Control. This match seems pretty favourable as they don't run much in the way of countermagic and their clock isn't overly fast. As such we generally have enough time to set up the combo or drop a Primeval Titan to find the win. 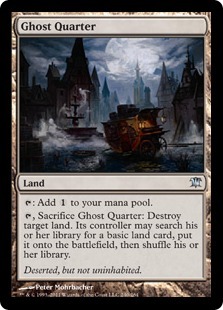 We also don't have to worry about Ghost Quarter or other non-basic hate as their mana base is too stretched to include them. A relatively new addition to the deck. 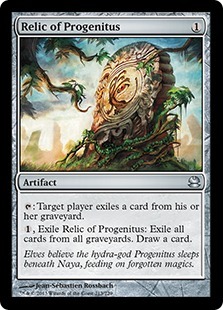 Hour of Promise is Primeval Titan 's effect put onto a sorcery spell, as the deck doesn't run any Deserts. The promise of this card (pun intended) is that you can cast it a turn earlier than Prime Time and it also gives you an additional card that can search up Valakut. I think most lists running Hour of Promise are putting it in the slot where Khalni Heart Expedition is in the list I played. Definitely worth a try. 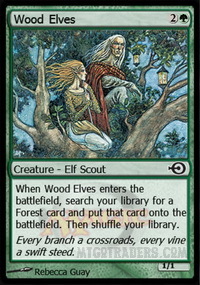 Some lists run a copy of Wood Elves . 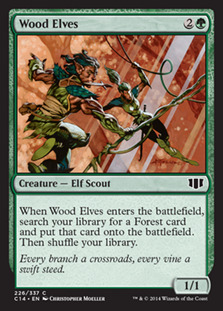 Wood Elves is essentially Farseek on a body which can be useful if we are expecting a creature heavy metagame. 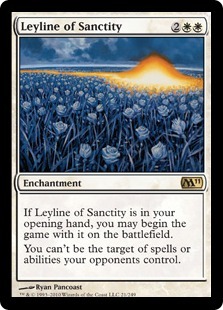 A land that can make your Scapeshift uncounterable. 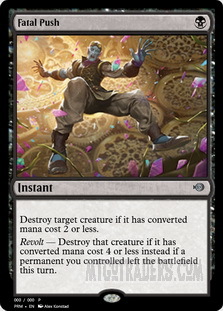 I don't really feel this is necessary in most matchups but is a way to force the combo through countermagic. It probably works best, if you are going to play it, in combination with Hour of Promise above. 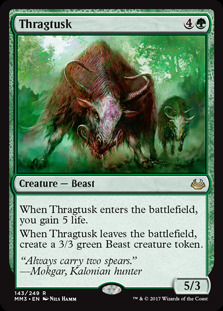 I've seen a few 1-of main deck copies of Thragtusk . Thragtusk is a nice roadblock against a lot of decks and the lifegain aspect is obviously substantial. 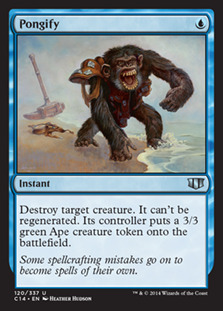 Again, this might be an adaption to consider if your expecting an aggro heavy metagame. I found Scapeshift to be a very powerful deck and one that still seems pretty good in the current metagame. 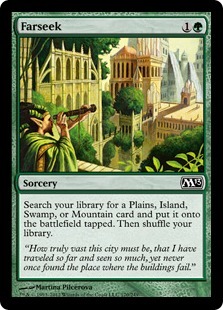 Unlike some combo decks generally it is pretty easy to play and the combo is really just a matter of counting your lands for the most part. I think the deck is quite beginner friendly provided you understand the combo. I thought I would need more tips and tricks to play this deck but it really is very straightforward. The deck is weak to Aggro deck but does have some nice tools to help buy the time it needs. Midrange decks tend to be good matchups as they give you the time to setup and our combo is generally quite difficult to interact with. Out and out Control decks can be problematic as we only have a small number of relevant spells, however, it is possible to win without resolving a Primeval Titan or Scapeshift if you get Valakut going. Coming off the Pro Tour, I am enjoying the excitement around Modern. I was kind of dreading the Pro Tour as I feared it might end up breaking the format but fortunately it has not happened and the format is in a really good place at the moment. There are also a lot of sweet decklists coming out of the Pro Tour and I plan to look at Pascal Vieren's UR Pyromancer deck in my next article in this series.